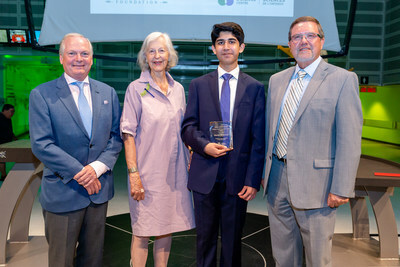 TORONTO, July 5, 2018 /CNW/ - High school student Danish Mahmood is already leaving his mark on the global scientific community, having won several awards at regional, national and international science fairs. 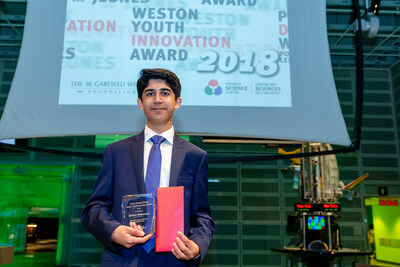 Today, the fifteen-year-old from London, Ontario adds another national award to his list — the 2018 Weston Youth Innovation Award — for his Wireless Interconnected Non-Invasive Triage System (WINITS), a device that assists first responders, EMTs, paramedics and hospitals to monitor patients' vital signs. Presented annually to a Canadian innovator between 14 and 18, the award recognizes the creative application of science and technology towards solving a real-world problem. "I love looking at problems the world has and trying to find solutions to those as that's what basically every scientist tries to do," said Danish Mahmood. "Knowing there have been casualties as a result of patients being left unmonitored in hospital waiting rooms, I identified a need for a system to connect first responders, EMTs, paramedics and hospital teams." Mahmood designed WINITS to improve the ability for first responders to identify patients who most need medical attention and prioritize them in mass-casualty scenarios, which is currently accomplished using a paper tag system. A non-invasive device, WINITS uses a biomedical finger sensor to continuously measures patients' blood pressure, heart rate, arterial blood oxygen saturation and body temperature. Patients' vital signs are shared wirelessly to an online dashboard accessible to first responders, EMTs paramedics and hospital teams, reducing the risk for human error while saving time, labour — and ultimately — lives. Mahmood's current prototype costs $110 to produce. "The jury was inspired by Danish's dedication, skill and ingenuity in recognizing a problem and developing a cost-effective solution that will assist health professionals to better assess and prioritize patients," said Dr. Maurice Bitran, PhD, CEO and Chief Science Officer, Ontario Science Centre. "We're pleased to provide Danish with the opportunity to share his project with our Science Centre audiences." Established in 2008, the Weston Youth Innovation Award encourages and recognizes young Canadian innovators. Named to recognize The W. Garfield Weston Foundation's $15-million lead gift to the Ontario Science Centre's Agents of Change initiative, the $2,000 award honours the Foundation's commitment to education. "The Foundation is extremely proud of its 60 year history of supporting excellence in education and innovation," said W. Galen Weston, Chairman. "We continue to be inspired by young Canadians like Danish who combine science, technology and creativity to solve real-world problems." In addition to the $2,000 cash prize, Mahmood will be recognized in an animation that showcases his award-winning device. The animation will run in the Science Centre's Weston Family Innovation Centre and be shared across its social media channels. For more information about the Weston Youth Innovation Award, including past recipients, please visit OntarioScienceCentre.ca/InnovationAward. Guided by our mission to inspire passion for the human adventure of discovery, the Ontario Science Centre strives to be a global leader in lifelong learning; a vital link in Ontario's education and innovation ecosystems; and a convener of public dialogue about technology, science and society. The Centre has welcomed more than 52 million visitors since opening as a Centennial project in 1969, pioneering an interactive approach now adopted by science centres around the world. An agency of the Government of Ontario, the Centre relies on funding from the province, as well as donations from generous individuals, corporations and foundations who share the Centre's vision to contribute to a more curious, creative and resilient world. Learn more at OntarioScienceCentre.ca.